Security operations KPIs vary from organization to organization. To be effective, it is crucial that KPIs are selected based on the SMART criteria. KPIs provide the critical information required to make fact-based decisions. However, tracking too many KPIs can become a burden to analysts. 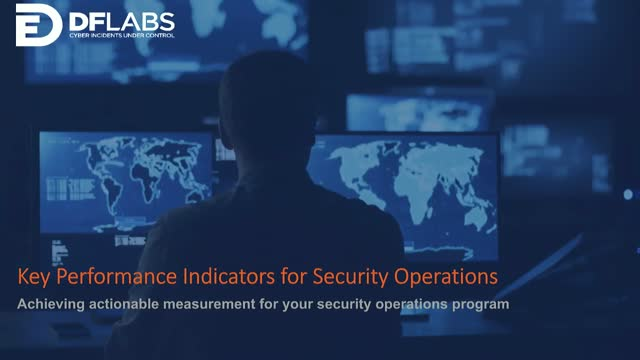 Join our new webinar to discover the best practices for Key Performance Indicators (KPIs) for Security Operations and Incident Response. - Why are KPIs important? - How to choose the best KPIs? - How many KPIs are appropriate to measure? The time it takes attackers to progress from initial infection to establishing multiple beachheads and beginning data exfiltration is often measured in minutes. Responding effectively under these adverse conditions requires complete network visibility, actionable intelligence and intelligent automation to augment human analysts. Carbon Black has long been recognized as the industry leader in endpoint detection and response, providing unmatched visibility into all endpoint activity. By incorporating actionable intelligence into their suite of tools, Carbon Black allows enterprises to respond effectively to both known and unknown threats. Carbon Black Defense brings Carbon Black’s extensive Endpoint Detection and Response (EDR) experience together with their cutting-edge next-generation antivirus technology to provide protection against even the most advanced threats. However, when a network event, such as a Web Application Firewall (WAF) or Intrusion Detection System (IDS) alert is the impetus for an alert, correlating endpoint data and identifying and containing the threat is largely a manual process. This allows attackers enough time to begin wreaking havoc on the network. In this webinar we will explore DFLabs’ Security Orchestration, Automation and Response (SOAR) solution, IncMan SOAR, and Carbon Black Defense, to show how these industry-leading solutions can work seamlessly together to automatically pivot from the network into the endpoint, automatically identifying and containing unknown threats to immediately reduce the risk to the enterprise. Empower your security analysts to accelerate detection and response of cyber incidents by combining the power of SIEM and SOAR. Based on the recent joint solution from DFLabs and LogPoint resulting from their deep two-way integration, join this webinar to see how two security operations tools can work seamlessly together fusing intelligence to improve the overall effectiveness and operational performance of your existing security program. While a SIEM solution delivers tons of valuable information about the security status of your IT system, a SOAR solution uses this information to automate the response needed to incoming cyber threats. Combining the two will free up valuable time and resources in any security program and make for faster, smarter detection, response, and remediation of potential incidents. Security analysts are subjected to such a volume and frequency of alerts that over time they can become desensitized to the information they are analyzing, resulting in critical alerts potentially being disregarded or missed. When responding to tens of thousands of security alerts a month, how can you reliably distinguish what's important from what's just a noise in the background? Join our new webinar to learn how a Security Orchestration, Automation and Response (SOAR) solution can help your overwhelmed cyber response team to "SOAR" above the noise when detecting, responding to and remediating a potential security incident. Our VP of Professional Services, Mike Fowler, will present proven best practices to reduce and avoid alert fatigue. ● What is “Alert/Alarm Fatigue” and why should you care? ● What is the impact of alert fatigue on Security Operations and Incident Response? As malware attacks continue, attackers are going to great lengths to obfuscate both the intent and capabilities of their malicious payloads to evade detection and analysis. In addition, the rate at which new malware is being developed has reached staggering new levels. Zero-day malware is increasingly common in all environments and signature analysis is becoming less effective. As a result, malware has become increasingly difficult to detect using more traditional detection mechanisms. Once detection occurs, it is often difficult to successfully analyze the malicious file to determine the potential impact and extract indicators. To successfully respond to a potential malware incident to contain the threat and block malicious traffic to minimize the impact, early detection and analysis are critical. In this webinar we will discuss how a security operations team can detect, analyze and respond to advanced, evasive malware by using DFLabs’ IncMan SOAR platform integrated with McAfee’s suite of tools including Advanced Threat Defense (ATD), Web Gateway and ePO for malware detection, while further being able to share critical security information using McAfee OpenDXL. Your registration information will be shared with McAfee who may contact you in follow-up to your registration and/or attendance of this webinar. IncMan SOAR from DFLabs is the only Security Orchestration, Automation and Response (SOAR) platform available capable of full incident lifecycle automation, including built-in, automated threat intelligence gathering, risk assessment, triage and notification, context enrichment, hunting and investigating, threat containment and more. This feature rich, unique and scalable solution provides context to security incidents, automates actions, orchestrates response to activities, while enabling full reporting and measurement functionality across all stakeholders. With its Open integration Framework, REST API and Automated START Triage, it is the most open and customizable SOAR platform in the industry, helping organizations to overcome some of the most common challenges and pain points when it comes to incident response. As organizations are exposed to more advanced and frequent attacks, speed of detection and response is critical in reducing financial and reputational damage. Cisco AMP for Endpoints leverages cloud-based analytics to detect and respond to advanced threats in real-time. Used with Cisco’s security suite, including Threat Grid, Umbrella and Umbrella Investigate, threats can be assessed, and assessments of the network performed; but this consumes valuable analyst time. IncMan SOAR allows security teams to automate repeatable tasks, including enriching initial threat indicators, allowing more time to focus on tasks which require human intervention. By combining these solutions, security teams can automate and orchestrate the process from initial alert, to containment and remediation, reducing actionable detection and response times from hours to seconds. DFLabs’ innovative Open Integration Framework is designed to enable security teams to customize and easily add new automated integrations between their existing security tools and our IncMan SOAR platform, enabling SOCs and MSSPs to add unique incident response actions without the need for complex coding. The new framework is part of DFLabs’ commitment to delivering a more open, community-oriented solution to automation and orchestration, which also includes a new Community Portal. The Community Portal serves as a hub for customers, where they can get the latest information and support from DFLabs and interact with other like-minded customers. Moreover, this Community Portal aims to provide a cooperation ecosystem for companies and organizations, where they can share integrations of security tools and IncMan SOAR. This approach will enable our customers to tackle specific use cases by uploading or downloading integration files from the Portal to IncMan SOAR. The latest release of DFLabs IncMan SOAR platform v4.5 includes a range of additional and enhanced features and capabilities highly focused around delivering a more open, extensible and community-oriented solution to some of the most challenging problems facing SOCs, CSIRTs and MSSPs today. Join this webinar to see first hand how DFLabs’ Open Integration Framework enables security teams to easily add and orchestrate new functions between IncMan SOAR and third party products even without coding experience. In addition, learn about additional new features including how IncMan SOAR’s enhanced REST API allows users to extend and integrate security automation and orchestration with other processes in new and exciting ways, as well as how its START Triage module now enables granular control over which events are automatically enriched to validate which should be converted directly into a security incident. As cybersecurity attacks continue to evolve accessing vital threat intelligence information is key. Valuable information is often scattered across many tools with varying degrees of confidence, which leaves investigators without a full understanding of the risk posed to their organization and ultimately prevents confident decision making at the most critical time in an investigation. Combined with the capabilities of DFLabs security orchestration, automation and response (SOAR) solution, IncMan SOAR; orchestrating the process and automating information gathering allows investigators to better utilize their time investigating an incident rather than focusing their valuable time and effort performing manual information gathering and the data correlation tasks necessary to prioritize an event. Your registration information will be shared with Recorded Future who may contact you in follow-up to your registration and/or attendance of this webinar. Using Threat Intelligence Effectively in Security Automation and Orchestration: A DFLabs and Cisco Use Case. Actionable intelligence is critical to responding efficiently and effectively to a potential security incident. Inaccurate or incomplete intelligence can lead to threats dwelling on the network, resulting in increased financial losses and irreparable damage to reputation. Once a threat has been discovered, decisive action must be taken to contain the threat. Cisco’s suite of detection, intelligence and response products, including Email Security Appliance, Threat Grid, Umbrella and Umbrella Investigate; offer security practitioners an unparalleled suite of tools, to address all phases of the incident response lifecycle. Combining the vast capabilities of Cisco’s suite of security products, with the orchestration and automation power of DFLabs’ IncMan SOAR platform, allows organizations to respond to potential security incidents, with unmatched speed and accuracy. Your registration information will be shared with DFLabs’ solution partner Cisco Security, who may contact you in follow-up to your registration and/or attendance of this webinar. Increased workload coupled with an industry-wide shortage of skilled responders is a common challenge heavily impacting operational performance in Security Operations Centers globally. An integral part of the solution is formulating a methodology to ensure that crucial knowledge is held and transferred between incident responders at all levels and overall retained within the organization. By utilizing Security Orchestration, Automation and Response (SOAR) technology, security teams can combine traditional methods of knowledge transfer with more modern techniques and technologies by incorporating machine learning and artificial intelligence capabilities. Join this webinar to learn about the benefits of implementing a SOAR solution, such as IncMan SOAR from DFLabs, and see how we can help to ensure that your organization’s knowledge is consistently and accurately retained, used and transferred, while simultaneously contributing to the efficiency and effectiveness of your entire incident response process. Join this webinar to get this unique opportunity to take a look at the new and improved IncMan SOAR platform and see first-hand one of the most exciting new features and first of its kind capability, START (Simple Triage And Rapid Treatment) Triage, in action. START Triage aims to dramatically reduce the number of security incidents generated from alerts and is being used in production by a major European bank to eliminate manual first line assessment of suspected fraudulent online transactions. IncMan SOAR has reduced triage time by 90% for cyber fraud events generated by its mainframe and other external systems. The flexible, open and customizable architecture of IncMan SOAR’s START Triage allows it to adapt to virtually any use case and data source, including network alerts, endpoint alerts, transaction fraud alerts, physical security events and threat intelligence alerts. Based on a new joint solution from DFLabs and LogPoint resulting from their deep two-way integration, join this webinar to see how two security operations tools can work seamlessly together fusing intelligence to improve the overall effectiveness and operational performance of your existing security program. Learn how DFLabs IncMan Security Orchestration, Automation and Response (SOAR) platform can help to automate, orchestrate and measure your security operations and incident response processes and tasks. Join this webinar and take a look at the latest version of IncMan SOAR, including a range of new features and integrations, and discover how we can help you to leverage your existing technologies and streamline your workflows. Learn how DFLabs IncMan can help you automate, orchestrate and measure your security operations and incident response. Join this webinar and get the unique opportunity to take a first-hand look at the new version of the IncMan Security Orchestration, Automation, and Response (SOAR) platform. These are just a few of the highlights, IncMan includes many other enhancements designed to streamline your orchestration, automation and response process. Incidents are fast-paced, dynamic events, forcing responders in to stressful and unfamiliar situations. Ineffective or delayed response to an incident can potentially lead to millions of dollars in lost revenue and damages. Even seasoned response teams require structure and leadership to respond effectively to an incident. This webinar offers a deeper look into the Incident Management System (IMS) and explains how when combined with a properly designed and implemented incident response process, the IMS can help organizations achieve a more effective and efficient incident management process, translating directly to a decrease in financial loss and reputational damage from incidents. - One of the core requirements of an IMS is that it must remain both flexible and scalable. - The first and most crucial step in implementing an IMS is integrating it into current organization processes and procedures. - Incorporating an IMS can elevate incident management to a level which is simply not possible with a more ad hoc system. - Utilizing an IMS for every incident large and small alike, will ensure that stakeholders remain proficient and in control of the process. Join us on this webinar as we try to answer the common questions surrounding how to increase the effectiveness of incident management, including the best set up of an Incident Management System, its structure and roles, when it should be used, as well as how an organization should go about implementation. DFLabs is a recognized global leader in security orchestration, automation and response (SOAR). The company is led by a management team recognized for its experience in and contributions to the information security field including co-edited many industry standards such as ISO 27043 and ISO 30121. IncMan SOAR – Cyber Incidents Under Control – is the flagship product, adopted by Fortune 500 and Global 2000 organizations worldwide. DFLabs has operations in North America, Europe, Middle East, and Asia with US headquarters in Boston, MA and World headquarters in Milano, Italy. For more information visit: http://www.dflabs.com or connect with us on Twitter @DFLabs. Demos and/or trials of IncMan SOAR are available immediately.